Here’s a look at what’s coming out from DC Comics for February 2018. As usual, the full list of solicitations is available here. The faux-Fantastic Four title I mentioned last month, “The Terrifics,” has been resolicited to debut this month. Unless I missed something earlier, “The Jetsons” has been scaled back into a six-issue miniseries (i.e., getting cancelled after issue #6) instead of an ongoing title. I wonder if this (plus, well, a lot of actual miniseries) would’ve worked better as a graphic novel instead of individual single-issue comics. Though that might be my feelings about that format. 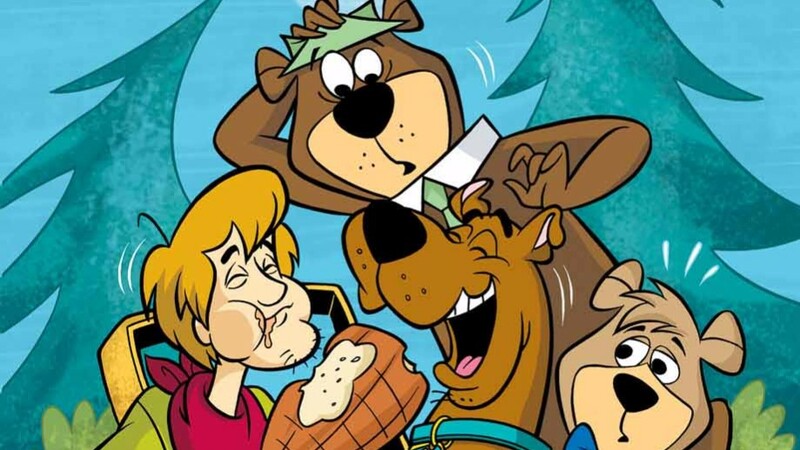 This month’s Scooby-Doo Team-Up is with Yogi Bear! It seems a bit overdue for Yogi to appear in the series; he’s one of Hanna-Barbera’s most popular characters, along with Scooby himself and the Flintstones. (Fred and company appeared fairly early in the series.) But better late than never for Jellystone Park’s most famous resident. The only animated meetings between the two I can recall are from “Laff-A-Lympics,” as the team captains for the two non-villain teams of the series. The crossover between Batman ’66 and Wonder Woman ’77 (the names DC’s given for the live-action 60s Batman TV series and the 70s Wonder Woman series) is collected in a trade paperback this month. All that’s missing is a “Superman ’52” series where a young Batman (or young Bruce Wayne) meets the George Reeves Superman! 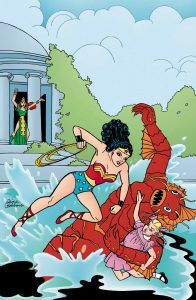 “Forgotten Legends” reprints the 1986 “Legends of Wonder Woman” miniseries. At the time, Wonder Woman’s long-running title had ended early in 1986; DC was preparing for the post-Crisis George Perez reboot, which didn’t come out until the following year. Thus, this miniseries, serving as a final send-off for the pre-Crisis Wonder Woman. It was written by Kurt Busiek and Trina Robbins, with art by the latter. Previous Post:What should a diverse Avengers team look like?